One of Iceland’s natural wonders is Jökulsárlón which means “glacier river lagoon.” It formed when the tip of Breiðamerkurjökull glacier (part of the Vatnajökull glacier) began to retreat from the sea in the 1930s. 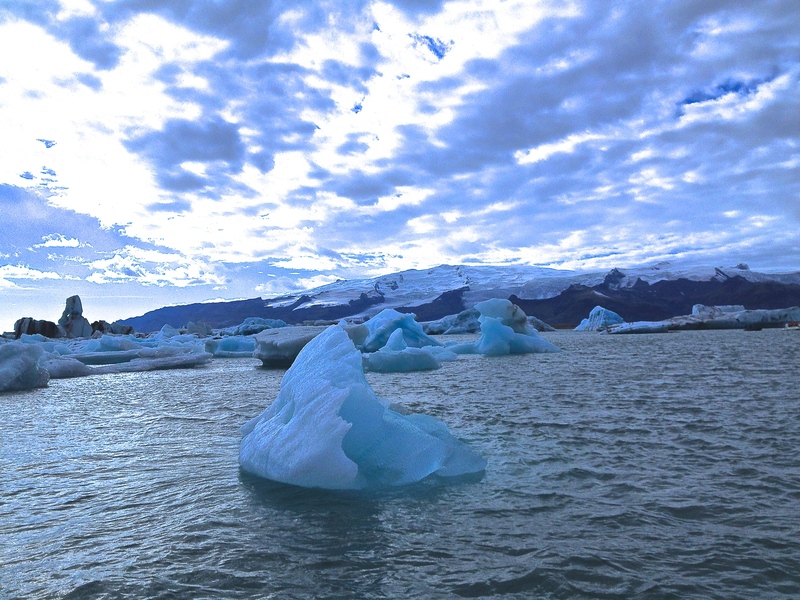 Large pieces of glacial ice break off the glacier to form create the striking icebergs floating in the lagoon. The lagoon was the backdrop for scenes from the James Bond film Die Another Day and most recently the new Bollywood film Dilwale. The lake developed just over 60 years ago and has doubled in size since 1975. Global warming is real, people. It takes over 4 hours to reach this area from Reykjavik so you can either leave very early, or make an overnight stop in the seaside village of Vik. 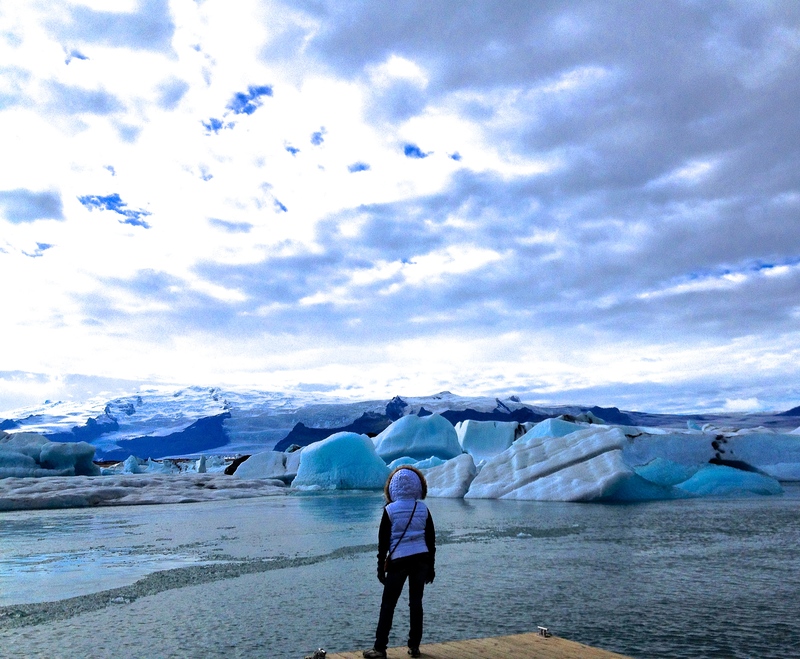 Once you arrive at Jökulsárlón, jump on board a boat to weave you between icebergs in the glacial lagoon. Plan a visit in July or August when the weather is the warmest (relative to the rest of the year) and the days are longer. If you want to get the best deals on hotels and airfare, travel a bit off season in early June or mid September. Remember, because of Iceland’s proximity to the North Pole, the days become shorter quickly. Summer travel, while more expensive, allows you to make the most of your time there (nearly 20 hours of sunlight in the summer!). By mid September, the temperatures drop and the days shorten to 11 hours making driving late at night more challenging on poorly lit roads. In the summer months you will need plenty of layers. Although Reykyavik may be pleasant during the day, the area surrounding the glacial lagoon will still be chilly and wet. Bring waterproof boots as well. If you have trouble sleeping, the constant daylight in the summer months may drive you crazy. So bring a sleeping aid, if you think you need it. The easiest way is by renting a car. Several tour companies will also offer tours from Reykjavik (379 kilometers away) which takes away the hassle of driving, allowing you to enjoy the scenery along the way. Depending on how many people you are traveling with, renting a car may be easier as well as more economical. The lagoon is located just off the Route 1 ring road. The cheapest way to get to Jökulsárlón is to hitchhike. Apparently, backpackers do this safely here, as Iceland has one of the lowest crime rates in the world. It is also possible to take the bus (route 51) to the glacial lagoon from the bus station in Reykjavik (called “Mjodd”). On the way to Jökulsárlón, be sure to stop by for a meal or an overnight stay in Vik. 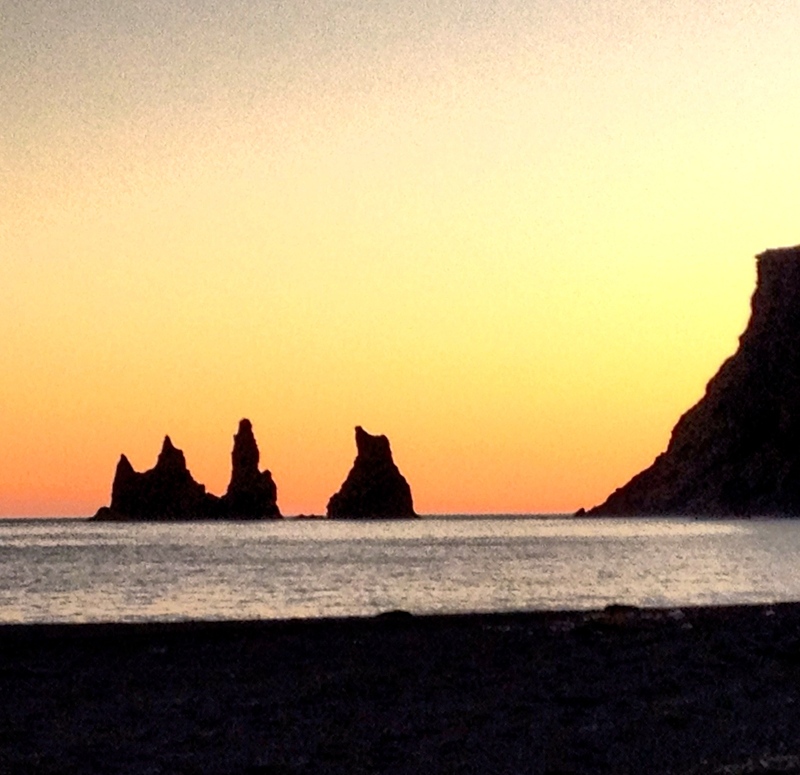 Vik is about 2 hours into your 4 hour drive from Reykjavik to the glacial lagoon. The black sand beaches here are truly unique, and the sunset here borders on magical. Another interesting site to note is the volcano Eyjafjallajökull. Uhh… What? Don’t waste your time trying to pronounce it – just know that it is the volcano that famously erupted back in 2010. It is located 30 minutes by car away from Vik en route to Reykjavik. Just follow the Route 1 ring road back to the capital.